Montiglio Piedmont, not far from Turin, is drop dead beautiful. Add to that the unbelievable but wonderful fact that you will be the only foreign tourist in town and clearly you have found a little private corner of paradise. You'll probably be the only tourist from outside of Piedmont too– very few Italians even know of this place. If you want completely undiscovered Italy then you can’t do better than this little Piedmont hill town set in the rolling hills of Monferrato. The town has it all, a stupendous setting, rich in history and full of magnificent architecture including a medieval castle. 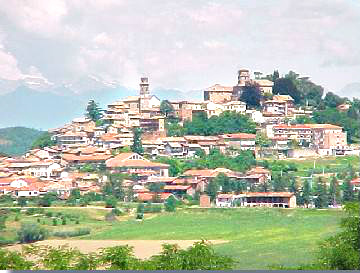 Montiglio also has great food, ideal for the true gourmand looking for a taste of authentic Piedmont cuisine. I am absolutely dumbfounded that such a gem has escaped wider notice and this can’t last so make sure you get here soon. You will really feel smug having this wonderful village all to yourself. Montiglio itself doesn't have anywhere that I'd recommend to stay at. The absolutely gorgeous surrounding countryside is another story with many excellent hotels and bed and breakfasts. My choice? The Locanda Antico Ricetto without a doubt. The Locanda Anitico Ricetto is about five miles down the road from Montiglio and not only is this a great hotel but the restaurant's authentic Piemonte cuisine is wonderful too. A great place to start a tour of the town is at the market (Fridays only) in Piazza Umberto. In the square itself you will find the little seventeenth Piedmont church of San Rocco. Make your way to Piazza Regina Margherita and take via Roma until you get to Piazza Belly. Not named after someone’s tummy but after a nineteenth century war hero of the same name. The eighteenth century church here with it’s bell-tower and frescoes by Pietro Ivaldi is lovely. Continue up via Roma until you get to piazza Umberto and the Castle of Montiglio built in 1300. The original castle walls were later extended and noble homes were built within the confines. A must see within the grounds of the castle is the Chapel Sant’Andrea, built in 1340. The frescoes within are some of the most impressive examples of fourteenth century art in Piedmont. Once you have seen the main the sights I would suggest walking around the town and exploring the little side streets. Savouring the atmosphere of centuries past and enjoying being in such a beautiful, authentic Piedmont town, among genuine Piemontese locals, people who have not yet been changed by tourism. The castle can be visited all year round with a guide and by booking, but try to visit in June when it is always open and a series of musical concerts are held here, an absolutely moving and emotional experience. The other good time – especially for gourmands of Piedmont cooking - is in October when the truffle festival occurs and the castle stays open over the whole period. For some other great places to stay in the Piedmont countryside click here.